Nestled at the center of the beautiful Coachella Valley and just nine miles from Palm Springs, Rancho Mirage Country Club sits at the crossroads of Bob Hope and Frank Sinatra Drives. The upscale, guard-gated residential community is surrounded by an 18-hole golf course and offers breathtaking views of the majestic San Jacinto Mountains. Rancho Mirage Country Club HOA is comprised of 266 detached and semi-detached homes, each offering scenic golf course and mountain views. If you would like to set up a private showing or would like more information about any of the above Rancho Mirage homes for sale, please give award-winning Rancho Mirage REALTOR® – Elaine Stewart a call. Elaine specializes in luxury real estate in Rancho Mirage and the surrounding area and would be delighted to answer any questions you may have. Call Elaine today! 760-668-2399. The Rancho Mirage Country Club (golf course) is a separate entity from the Rancho Mirage Country Club HOA. Currently, the golf course is closed but slated to reopen in 2020. The course is watered, well-maintained, and green, providing scenic views from all of the surrounding homes. Along with a new boutique hotel, the new golf course will offer 18-holes of challenging golf and will be open to homeowners, guests of the hotel, and likely to the public. Now is the perfect time to buy in Rancho Mirage Country Club as home values and prices are only going up with the new Rancho Mirage Country Club golf course coming soon. Rancho Mirage Country Club homes for sale are priced from $385,500 – 777,000. Overall median home values in Rancho Mirage are at $488,700. Home values have gone up 6.7% over the past year and are predicted to rise another 2.6% within the next year (source). Located between Cathedral City and Palm Desert, Rancho Mirage is one of the nine cities of the Coachella Valley – Palm Springs area. Offering abundant sunshine, beautiful scenery, and resort-style amenities, Rancho Mirage Country Club homeowners enjoy convenient access to world-class shopping and fine dining, exciting cultural and recreational offerings, an abundance of outdoor activities, and first-rate medical facilities. Corporate executives, political leaders, celebrities and other notable personalities all make Rancho Mirage their home due to its renowned quality of life. Rancho Mirage has many exclusive gated communities, beautiful golf courses, top-notch tennis facilities, and a number of world-class resorts. The Ritz-Carlton, the Omni Rancho Las Palmas Resort, the Westin Mission Hills Golf Resort & Spa, and the Mission Hills Country Club are all located in Rancho Mirage. The Rancho Mirage Community Park offers a 1,000-seat outdoor amphitheater under the sky and is host to a variety of entertainment throughout the year for residents and visitors alike. Several world-renowned medical facilities are located in Rancho Mirage including Eisenhower Medical Center, The Betty Ford Center, and the Barbara Sinatra Children’s Center. The Children’s Discovery Museum of the Desert and the Braille Institute can also be found here. Rancho Mirage offers its residents the perfect blend of luxury, value, and convenient access to some of the country’s finest golf, spa and dining experiences, along with proximity to El Paseo (the Rodeo Drive of the desert) in Palm Desert and the Palm Springs International Airport. 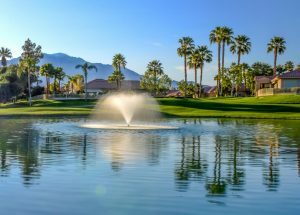 Rancho Mirage Country Club is a special community and once you experience all that the surrounding area has to offer, you’ll definitely want to consider calling it your new home! With over 24 years of real estate experience, Elaine Stewart offers a wealth of local market knowledge and expertise. Elaine is a licensed, professional Rancho Mirage REALTOR® and is committed to providing her clients with accurate, reliable and trustworthy information and the personalized service they deserve. Elaine truly enjoys helping her clients get into their dream home in the Coachella Valley and is an expert at uncovering the right homes in the right neighborhoods that are the best match. She would be delighted to speak with you about Rancho Mirage Country Club homes for sale and help you decide if this desirable community is the ideal fit.